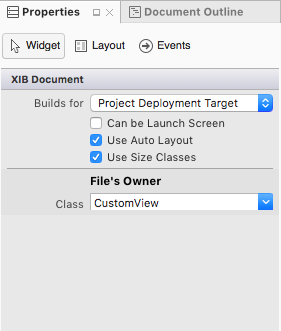 How to create a custom control (UIView) with XIB so that it's available in Xamarin iOS designer? which seem to be a bit outdated (?). Anyway, I got to the point where my view is shown under Custom components in Toolbox but when i drag it to any storyboard, I get the attached error (NSInternalnconsistencyException, and clicking that error crashes Xamarin Studio). I am using Xamarin Studio with Mac. Is anyone able to help? A working code example of how such component is done would be very helpful. I think this kind of feature is quite essential for professional development.. Rebuild the project and your CustomView should now be visible in the Custom Controls of the iOS Designer. Note, however that you will not get rendering of the actual content in the Designer. Hey, Can you please give me sample project for this ? Here crashes my application and I got a StackOverflow exception. Can you please show us your CustomView.xib file? Which properties did you set there inside? After having the same issue, there were few things that weren't clear to me and caused the error. I'll write it here in case your case (or other that will get to this post) is the same. 1. 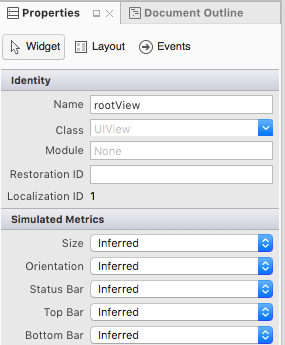 It is critical to set the class property of the custom view to be UIView or just leave it empty. It shouldn't be from type "CustomView". rootView is the top view within the xib file and we need to name it rootView (or any other name). Going through these steps fixed the issue for me. Maybe it will be useful for someone else. Thank you for helping me with some code snippets. I am getting below error will trying to create a custom view at runtime. Objective-C exception thrown. Name: NSUnknownKeyException Reason: [ setValue:forUndefinedKey:]: this class is not key value coding-compliant for the key rootView. How can I do to send data for custom view? I also have this error. Wasted a day trying to create a simple view that I can re-use. Why is this so hard and poorly documented. I managed to create my custom view and add it to my storyboard but autolayout constraints are not working !